“Come and See!” is our theme for Advent this year. Advent is a waiting time, the time when we remember all the ways that God comes to us, and specifically, when Jesus came, God in the flesh, our Emmanuel. 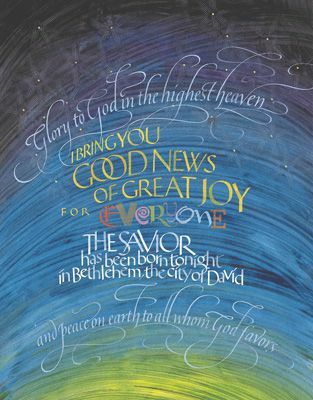 Each year during Advent we remember the long years spent waiting for the predicted Messiah. We remember that our God came to earth as a tiny, vulnerable, human baby. Like the shepherd on that frosty night, we come and see the little one, and remember that our God knows what it is to be human, to be cherished by family, cared for by loved ones, revered by the wise, rejected by others, betrayed by friends, and, eventually, killed for speaking truth to power, and attempting to empower the vulnerable. When the [shepherds] saw this, they made known what had been told them about this child; and all who heard it were amazed at what the shepherds told them. We, like the shepherds, are called to come and see, and then to go and tell! This year, who needs to come and see? Who are you called to go and tell? God gives you power to see the vulnerable, speak for the powerless, invite the skeptical, share with those who need help, and most of all, love like the one who came to us. Jesus, the child born poor, who brings us good news of great joy for all the people. Our Messiah, our Jesus, come and see!